I don’t want to tell you how many cookies I ate at the cookie swap and in the days that followed. Just know that it was way too many. Truth be told I did share my loot from the swap with my kids, and I did try to take only tiny bites of everything. But wow. So many cookies from so many talented bakers…it was hard not to overindulge. It will therefore come as no surprise to hear that I woke up all sugar’ed out today. And since I’m taking a cookie decorating class with none other than Gail Dosik/aka One Tough Cookie this weekend(!!! ), I decided to spend a few days “eating clean”. 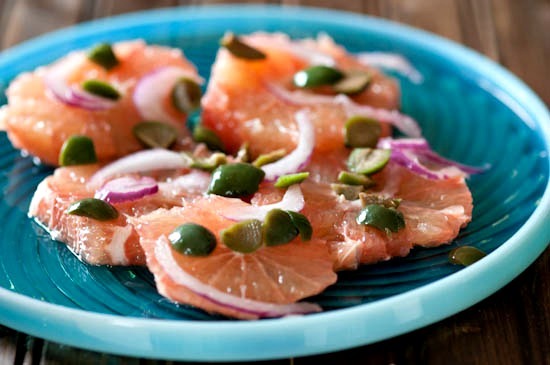 Enter this Savory Grapefruit Salad. To make enough of this salad to feed one person (maybe two), you start with one large pink grapefruit. Using a very sharp knife, slice the skin off the top and bottom so your grapefruit sits flat. Then, working from the top of the grapefruit to the bottom, slice all the skin off the grapefruit. Make sure to slice away all the white “pith” because it’s bitter. 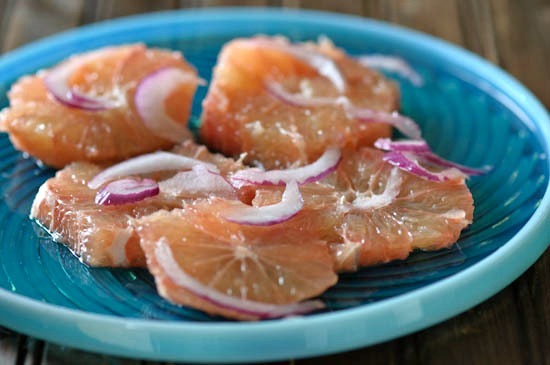 Next, slice the grapefruit crosswise into 5-6 segments (you could “supreme” it instead, if you like; that would give the salad a different look). Then take a small handful of very thinly sliced onion which you’ve doused with a bit of rice vinegar, and arrange it haphazardly over the grapefruit slices. Sprinkle a little coarse sea salt on top. Somehow I left off the chile flakes Tamar put in her description, but I will certainly add them next time. And while I didn’t have any on hand, I think some minced parsley would add a nice touch to this salad. I think additional greens would work in here, too, and I plan to make it again soon with some hearty baby lettuces from my garden. I love pink grapefruit. Almost as much as I love cookies. Love you, Winnie. Can’t wait to see you this weekend! 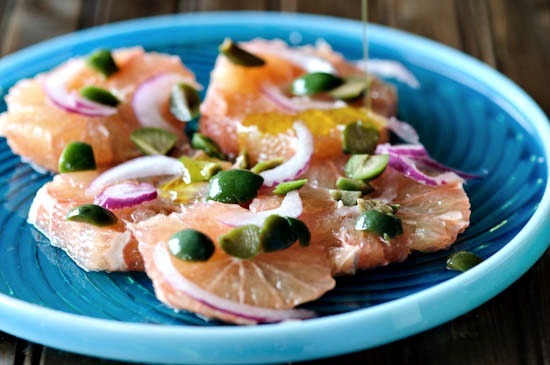 You always make such interesting sounding dishes – I love the idea of grapefruit being used in a savoury way! Looks beautiful; i use Meyer Lemon slices and juice too. How unique! I love grapefruit and I love this! I recently discovered your blog and I am delighted. I’ve noticed some recipes to do. 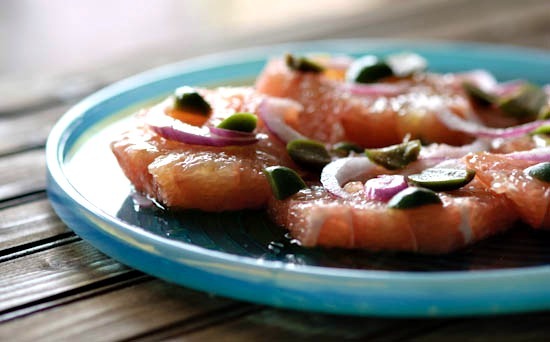 I love this tasty & refreshing pink grapefruit salad a lot! Just beautiful & appetizing! ;) Yum!! I’m having a cookie swap tonight, so I might need to do a similar salad tomorrow! Thank you for sharing yourself and your culinary explorations. I’m glad I get a glimpse! I hope you have a restful weekend. So pretty! 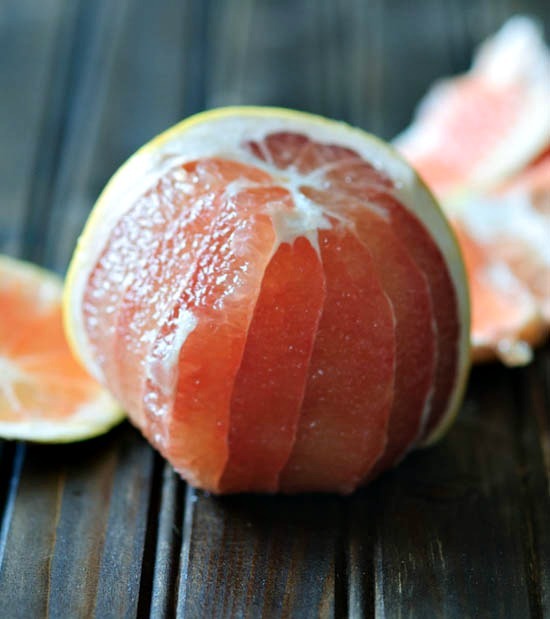 I love grapefruit… I think I will pick up some grapefruit at the store tomorrow and make this one for me. I could use a bit of sugar detox at the moment. What a lovely salad! Your description has me craving it now … grapefruit is on the shopping list now. I just started reading Tamar Adler’s book last night and couldn’t put it down. 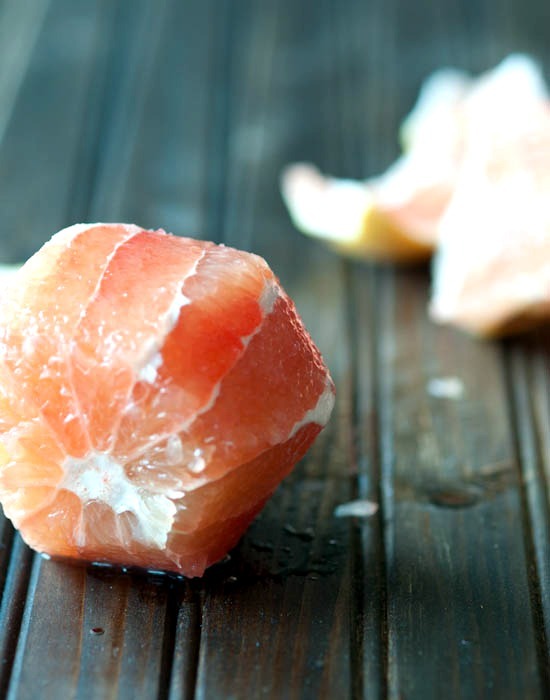 I am so into anything citrus right now, and I’ve got just the perfect grapefruit in my refrigerator right now for this recipe. And I’m going to look into the cookbook you recommend here!! Thanks!